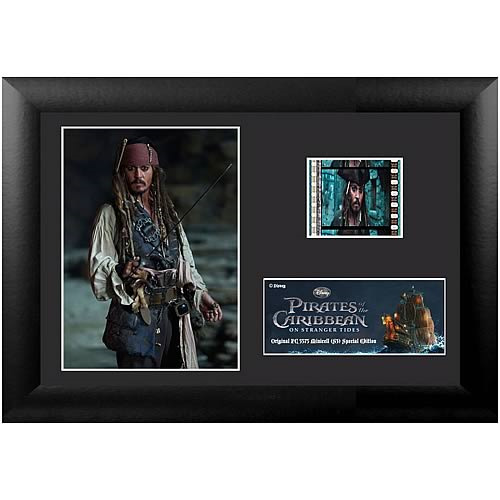 Shopping for Pirates of the Caribbean Film Cells? Johnny Depp returns to his iconic role of Captain Jack Sparrow in an action-packed adventure. Crossing paths with the enigmatic Angelica (Penelope Cruz), he's not sure if its love or if she's a ruthless con artist whose using him to find the fabled Fountain of Youth. When she forces him aboard the Queen Anne's Revenge, the ship of the legendary pirate Blackbeard (Ian McShane), Jack finds himself on an unexpected adventure in which he doesn't know whom to fear more: Blackbeard or Angelica, with whom he shares a mysterious past. The film strip portrayed in the image above is only an example of the film cells you may receive. Please note, the cells may vary from piece to piece because they are hand selected from reels of film. This item contains clips of the film and portrays memorable images and scenes all on a stunning descriptive plaque. These elements have been double mounted and placed within a beautiful black wood frame measuring 7 1/2-inches wide x 5 1/2-inches tall. The Pirates of the Caribbean On Stranger Tides Series 3 Special Edition Mini Cell even comes with a certificate of authenticity.